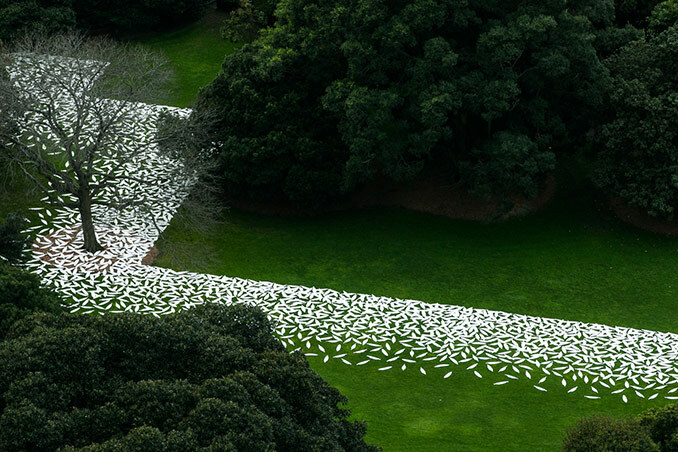 Kaldor Public Art Project’s most ambitious project to date and the first to be created by an Australian Aboriginal artist was today unveiled in Sydney’s Royal Botanic Garden in advance of its 17-day, free-to-the-public presentation from 17 September until 3 October 2016. Sydney-based Wiradjuri/Kamilaroi artist Jonathan Jones created barrangal dyara (skin and bones) for the 32nd Kaldor Public Art Project, inspired by the history of the 19th century Garden Palace building which originally stood in the Royal Botanic Garden between 1879 and 1882 before being burnt to the ground in 1882. 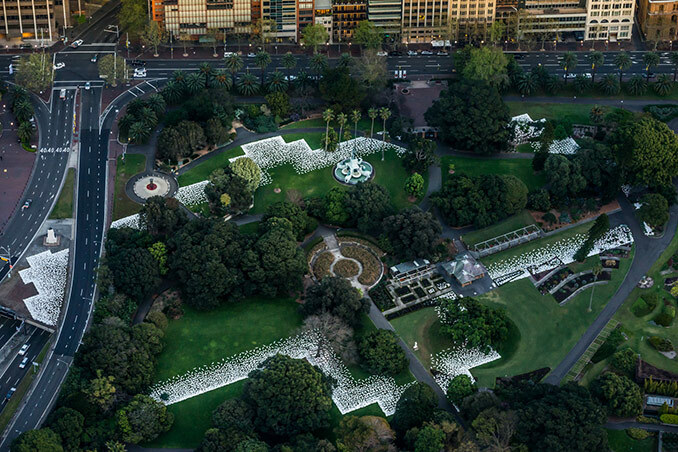 The ambitious contemporary art project barrangal dyara (skin and bones) is expected to attract enormous numbers of visitors and is a major component of the Royal Botanic Garden’s Bicentenary Celebrations. 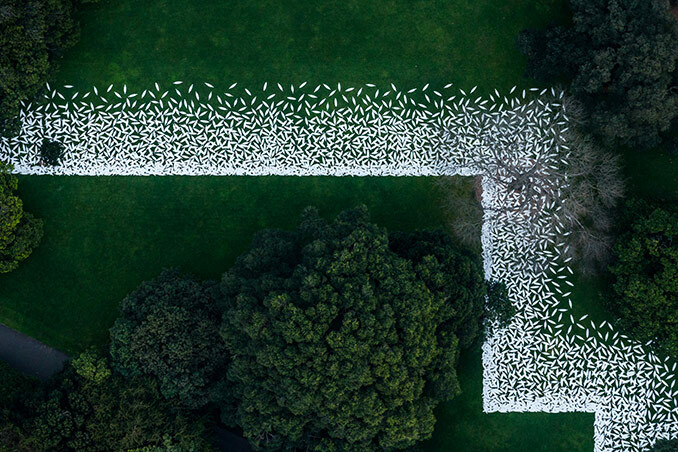 The work includes a vast sculptural installation of 15,000 white shields spanning the 20,000 square-metres of the site, marking the original foot-print of the Garden Palace building. At the heart of the installation, where the Garden Palace’s dome once crowned the city, a dynamic native meadow of kangaroo grass disrupts the garden’s formal European design. Eight Aboriginal language soundscapes developed with communities throughout the south-east of Australia are installed throughout the site. The project is being activated and enlivened daily by an extensive free public program of events including presentations of Aboriginal language, performances, talks and workshops for people of all ages. 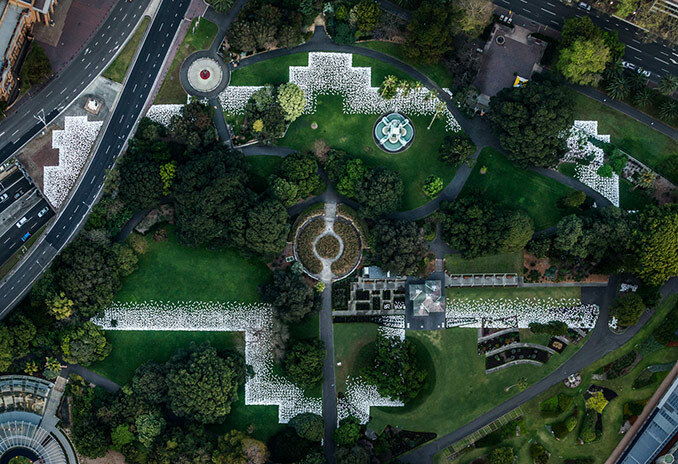 Kaldor Public Art Projects has also collaborated with many of Sydney’s leading cultural institutions, who are linked to the story of the Garden Palace, with each partner creating tailored programs to support and complement barrangal dyara (skin and bones). Program partners include Bangarra Dance Theatre; the State Library of New South Wales; Sydney Conservatorium of Music; the Museum of Arts and Applied Sciences; Art Gallery of New South Wales; Sydney Living Museums and the Australian Museum. The project takes its name, barrangal meaning ‘skin’ and dyara ‘bones’ from the local Sydney language on whose country the project takes place, with approval from the community. 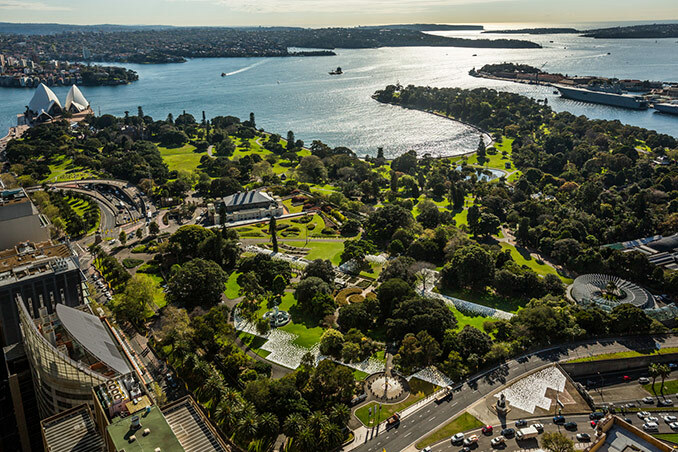 Kaldor Public Art Projects and Jonathan Jones have connected directly with many Aboriginal communities in Sydney and greater south-east Australia to develop the work under the guidance of an Aboriginal Advisory Board. The thousands of shields laid across the Garden echo the masses of rubble left over after the fire, raising the bones of the Garden Palace for a contemporary audience. Each shield takes its shape from one of four typical shield designs from the south-east of Australia and speak to not only the significant number of cultural objects lost in the Garden Palace fire, but also the presence of objects on this site, used in ceremonies over countless generations. The native grassland nods to the long cultural practice of Aboriginal agriculture and management of crops such as kangaroo and wallaby grass, and native millet. 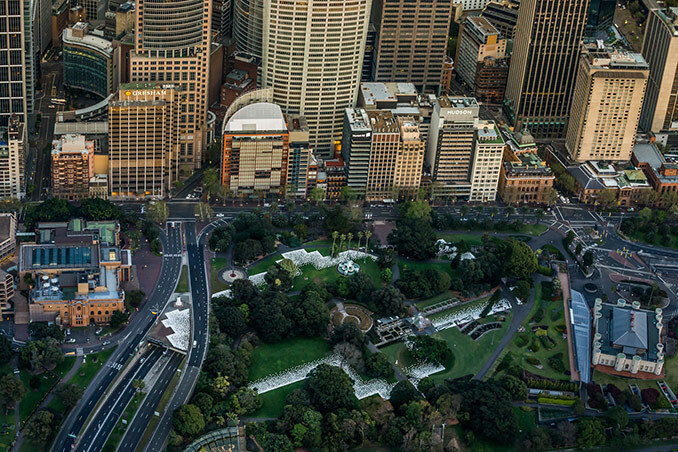 The language soundscapes spoken in: the Sydney language; Gumbaynggirr; Gamilaraay; Gunditjmara; Ngarrindjeri; Paakantji; Woiwurrung and Wiradjuri, allow for the project to develop from a state of loss and mourning into a celebration of the resilience of the world’s oldest cultures. 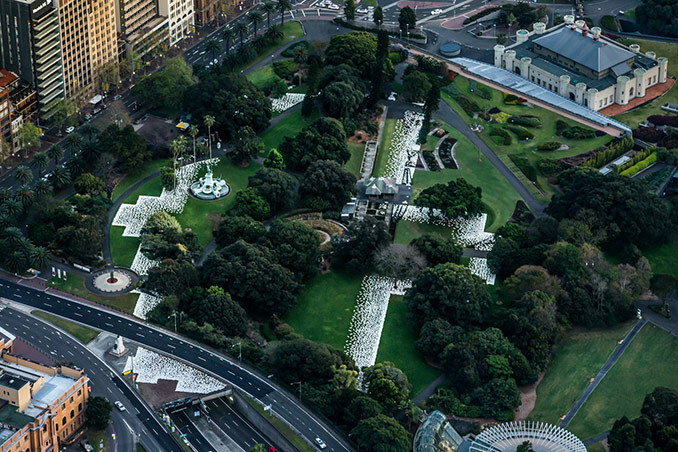 Visitors to the project will be able to enhance their experience by downloading the free Project 32 app, created by Optus in consultation with Kaldor Public Art Projects, Jonathan Jones, and with input from lead corporate partner Commonwealth Bank of Australia. The Project 32 App activates as visitors walk the site, allowing them to hear insights from with cultural leaders, historians, theorists, artists, writers and cultural practitioners as they discuss the ideas surrounding barrangal dyara (skin and bones). Available at the iTunes and Google Play stores now.